Ellington’s Storybook Cottage or Castle? In preparation for this month’s tidbit, featuring Douglas Ellington’s unique and quirky home in Chunns Cove, I first began my thinking process, by asking myself- “What Style Is It?” As we’ve seen with his other projects, Ellington’s designs were often a blend of different styles overlaid by his own distinctive style. That being said, it dawned on me that Ellington’s home had the hallmarks of houses designed in the “Storybook Style”. So off to my bookshelf I went to consult Gellner & Keister’s book, Storybook Style: America’s Whimsical Homes of the Twenties, for some background material on the style. Imagine my surprise while thumbing through the book, to find Ellington’s home as one of the homes featured in the book. That not only confirmed my thinking, but also made sense to me as I knew that one of the authors, Douglas Keister, who is a professional photographer, has often been to Asheville for the Annual Arts & Crafts Conference at the Grove Park Inn. By the mid-1920’s, even classically trained architects, were designing in the “Storybook Style”. However, most of their designs were exaggerations of the then prevalent revival styles being proliferated by architects and builders who had seen and experienced the rural architecture of European countries while serving in World War I. These storybook homes, instead of resembling the dwellings of witches or fairies, as the earlier storybook homes had done, were being designed to resemble the idyll of rural European farmhouses, cottages or castles. Ellington began to build his home in 1926, at the height of his burgeoning architectural practice, while he was also handling numerous major architectural commissions in Asheville. In designing and building his home, Ellington creatively orchestrated an assemblage of salvaged, recycled, and new architectural materials, while still maintaining his own distinctive style. We see in his home familiar Ellington design motifs such as: round arches at the entries, prominent tower (above front door and simulated at the chimney), use of local and natural materials, use of colored materials to achieve a distinctive color palette, and his masterful use of architectural components and materials, such as oversized stone voussoirs, multiple brick patterns, and polychromatic masonry, to achieve textural and aesthetic interest without the use of applied ornament. Simply using patterned brick walls for the south section of the house, stone and brick for the center section and log timbers for the northern section provides visual and textural interest, while at the same time maintaining what architectural historian and preservationist Douglas Swaim, calls “an overall effect of organic unity”. Three attributes distinguished Storybook homes like Ellington’s and set them apart from the prevalent revival styles of the time, such as Tudor, French Country, Spanish Revival, and Georgian homes. These attributes according to Gellner & Keister, were “their exaggeratedly plastic and often cartoonish interpretation of medieval forms, their use of artificial means to suggest great age, and last, that all but indefinable quality known as “whimsy”.” Ellington’s home fits into the genre of Storybook homes because it has achieved the artifice appearance of an aged home by the use of recycled and salvaged architectural parts (many were overstocked materials from those major commissions), supplemented with new natural materials such as brick, stone, and iron. The home’s exaggerated stone entrance and tower, and adjacent bank of windows, similar to those in a medieval Great Hall, is a cartoonish interpretation of an ancient castle. And the home certainly has a sense of whimsy-one example being the stained-glass window in one of the exterior doors. Besides having an odd assemblage of different types of glass, including two “bull’s eyes”, the window features a painted pane with two medieval men shaking hands above the inscription: “Welcome ever smiles, and farewell goes out sighing”. The house is a long mass, built up of three distinct elements covered by a complex, wood-shingle roof, and set into a grassy, terraced clearing on the wooded hillside. Ascending from the parking area, one arrives at the building at its southwest corner. From south to north, the major components are: a two-bay, one and one-half story brick “cottage” under a broad-eaved, wood shingled hip roof pierced by wall dormers; a five-bay, uncoursed stone central block which presents a tall parapeted wall on the principal elevation; and a traditional single-room log cabin said to have been on the property when Ellington bought it and thought to be over one-hundred years old. Ellington exhibited the traits of a typical creator of a Storybook home. Author Arrol Gellner says that Storybook homes were the “product of architects and builders with a distinct flair for theatre, a love of fine craftsmanship, and not least a good sense of humor”. Ellington, the architect and fine-arts painter, used these very traits to produce his unique and quirky home, nestled into a hillside near the end of Chunns Cove. His home has all the hallmarks of a Storybook Style house. Brick Section of house: RHC-057-DS Creator: Richard Hansley, “DOUGLAS ELLINGTON HOUSE”, Richard Hansley Photograph Collection, North Carolina Collection, Pack Memorial Library, Asheville, NC. Brick patterns and colors: RHC-057-DS Creator: Richard Hansley, “DOUGLAS ELLINGTON HOUSE”, Richard Hansley Photograph Collection, North Carolina Collection, Pack Memorial Library, Asheville, NC. Sketch of Ellington’s House by Richard Hansley: RHC-057-DS Creator: Richard Hansley, “DOUGLAS ELLINGTON HOUSE”, Richard Hansley Photograph Collection, North Carolina Collection, Pack Memorial Library, Asheville, NC. Livingroom-Great Hall: RHC-057-DS Creator: Richard Hansley, “DOUGLAS ELLINGTON HOUSE”, Richard Hansley Photograph Collection, North Carolina Collection, Pack Memorial Library, Asheville, NC. Exterior Rear Elevation: RHC-057-DS Creator: Richard Hansley, “DOUGLAS ELLINGTON HOUSE”, Richard Hansley Photograph Collection, North Carolina Collection, Pack Memorial Library, Asheville, NC. 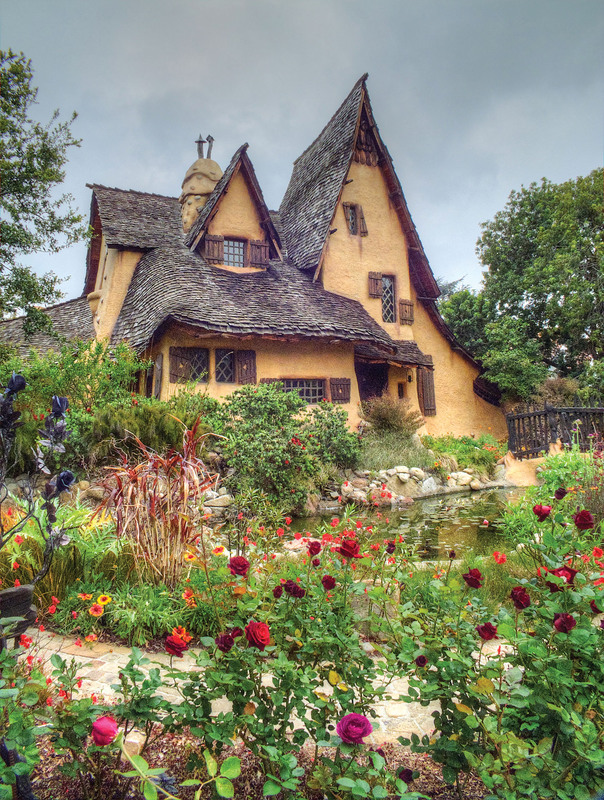 Arrol Gellner and Douglas Keister, Storybook Style: America’s Whimsical Homes of the Twenties. (New York, NY: Viking Studio, 2001), page 13. National Register Nomination for “Douglas Ellington House”, April 1986. http://www.hpo.ncdcr.gov/nr/BN0179.pdf Section 7. Description. Gellner & Keister, Storybook Style., page 1.